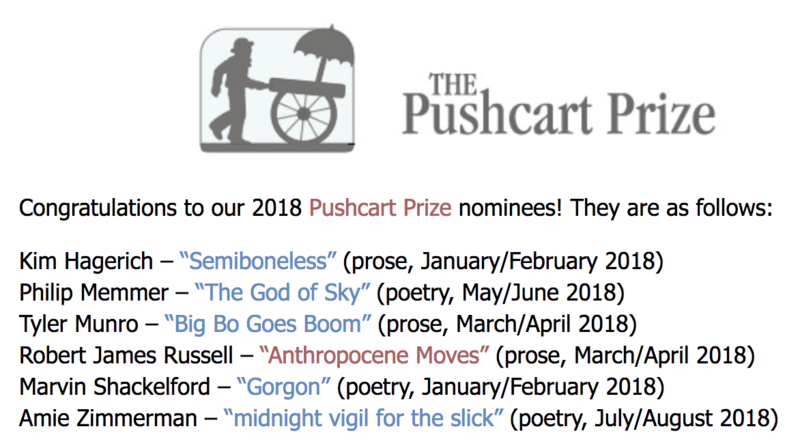 I’m honored: My creative nonfiction piece “Anthropocene Moves”—about life and loss and bringing extinct animals back from the dead + paired with original illustrations by John Vestevich—was nominated for a Pushcart Prize by decomP! You can read “Anthropocene Moves” here (or, there’s audio of me reading the piece at the top of the story page, if that’s your bag!). I’m just so grateful to be a part of this amazing cohort. A huge thanks to Jason Jordan (and the rest of the decomP team) for being so gracious.